Dig this speech made by a senator from the distant past. I made a few changes to the text, marked in italics. I may say with truth, that in few countries so much is left to the share of the laborer, and so little exacted from him, or where there is more kind attention paid to him in sickness or infirmities of age as it is under socialism. Compare his condition with the tenants of the poor houses in the capitalist portions of the world–look at the sick, and the old and infirm laborer, on one hand, in the midst of his family and friends, under the kind superintending care of the government, and compare it with the forlorn and wretched condition of the pauper in the poorhouse. Does that sound like Kamala or Bernie or Hillary or any of the rest of the socialists or what? The original speaker was John C. Calhoun of South Carolina and he was talking about slavery, which isn't much different from socialism. Slaves/workers get health care, housing, guaranteed work, heck, they get dignity. In exchange for that, the master/government gets some of the fruits of his labor. Don't look too carefully at how big that "some" might be. If you want to read the original, you can find it here. I'm always struck by how similar the pitch for socialism is to the pitch for slavery as a moral good. When I saw this Calhoun speech excerpt this morning, it leaped off the screen at me. 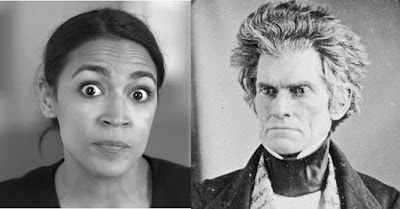 Is there something about being a pro-slavery Democrat that makes your eyes bug out like you're completely bonkers?